Since Floki is a Siamese cat, he has the trademark cross-eyed look. Here it seems that his left eye is looking at the camera while his right eye is checking something else out. I believe the condition is caused by a slight misalignment of the retinas so he really is focusing on just one thing. I think it adds to his cuteness. What do you think? 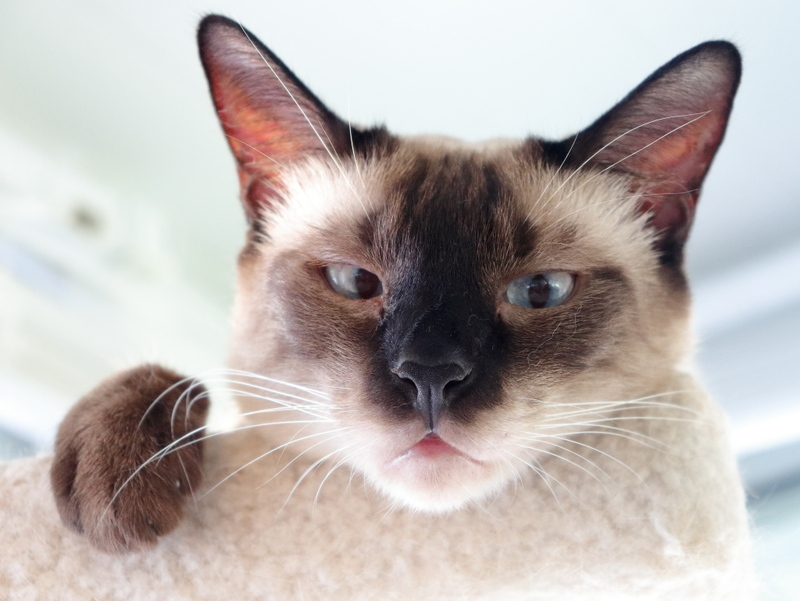 This entry was posted in Uncategorized and tagged cat, cross-eyed, cute, eyes, Siamese on March 29, 2019 by Charles Huss. You have probably heard that Siamese cats are cross-eyed. That is true, as you can see from this photo of Floki. I have heard a couple of different reasons for this. One is that their retinas are slightly off center so crossing their eyes allows them to see better. Another has to do with the way their brains interpret the images. That I didn’t really understand so I will leave it at that. I also read that some breeders have bred this cross-eyed trait out without actually fixing the misalignment problem so if you see a straight-eyed Siamese cat, he or she may not have ideal vision. This entry was posted in Uncategorized and tagged close up, cross-eyed, cute, Siamese cat on July 13, 2018 by Charles Huss.